The first generation Apple iPad first debuted in April 2010. Since its original release, Apple has continuously improved upon the product releasing numerous new versions and iPad models. Whether you bought one when it first came out, or you're just curious about how it all started, here are some of the key details about the 1st Generation iPad. The first iPad ran a modified version of the iPhone OS (in this case, version 3.2). It added things like contextual menus that weren't available on the iPhone or iPod touch at the time. These days, the iPad and iPhone run the same version of the iOS, the new name given to the iPhone OS as of iOS 4. The first iPad weighed in at 1.5 pounds (1.6 pounds in the 3G version) and was 9.56 inches tall x 7.47 wide x 0.5 thick. The screen was 9.7 inches. The 1st Generation iPad offered a screen resolution of 1024 x 768 pixels. 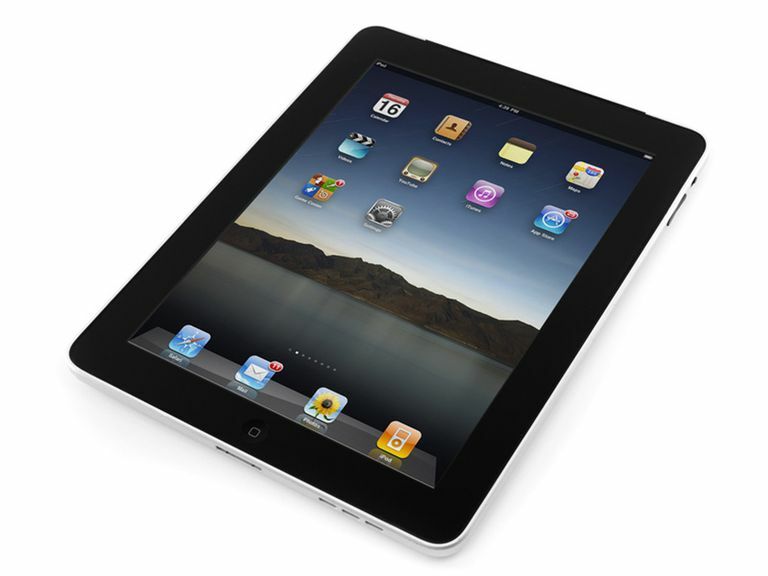 Learn about all of the iPad specs with our article, First Generation iPad Hardware Specs. While there were virtually no native iPad apps at the time the iPad was released (other than those that came pre-installed on it, at least), the first-gen. iPad was compatible with nearly all existing iPhone apps at the time. Those iPhone apps were able to run in two modes: in a window about the size of an iPhone screen or scaled-up to fullscreen mode. Fullscreen took advantage of the iPad's larger screen, but because the apps' graphics were generally designed for the smaller iPhone screen, images often looked jagged or blurry. Native iPad apps soon started being released and apps no longer run in two modes: all iPad apps are now fullscreen. There are now over 1 million native iPad apps available. Downloading apps to the original iPad was just as easy as it is today, but proved more difficult with each iOS update. Apple officially stopped supporting the 1st Generation iPad with the iOS 6 update, but there are still ways to download apps to the first gen iPad. The original iPad debuted as a Wi-Fi-only device. Shortly after the initial launch, though, Apple debuted a Wi-Fi/3G model that offered offer full Assisted GPS (A-GPS) like the iPhone 3GS offered at the time (and all subsequent iPhones and cellular iPads have offered). Like the original iPhone model, which did not include GPS, the Wi-Fi-only iPad used Wi-Fi triangulation for its location services. Also like the original iPhone, AT&T was the only phone company that provided 3G service to the original iPad at launch. (Verizon offered service through its Mi-Fi plans, but iPads could not connect directly to Verizon until later models were released). Apple marketed the device as unlocked, but the first generation iPad didn't work with Sprint, T-Mobile, or Verizon in the U.S. due to differences in the networks and the chips used in the iPad. Syncing the first generation iPad was pretty easy and very similar to syncing an iPhone. Setting up a new iPad, however, has since changed with each subsequent version of the iOS. While the original iPad is sorely out of date for most users, there are still some great ways to use an old first generation iPad. That said, given the tremendous improvements in iPad hardware that have been made over the years, and since the 1st Gen. iPad is 6 versions of the operating system out of date, it's well past time to upgrade to a new model. If you're ready to upgrade, check out our buying guide: How to Buy an iPad.